If you dye your hair, you probably love the color but hate how dry and brittle your locks feel. 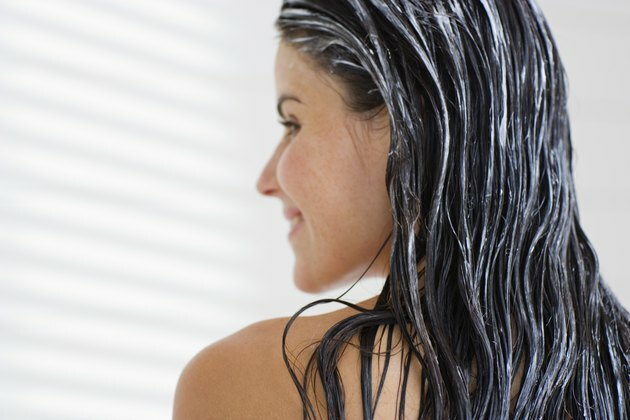 Dyeing stresses hair by stripping away natural oils, lipids and nutrients, which causes it to weaken and break. If you're sick of losing your strands, you don't need to swear off coloring forever. Instead, give your dyed hair the special treatment it craves. Wash your hair less every other day or less often, if possible. Use lukewarm or cool water. If you wash daily, you're removing natural oils from your hair and skin. If you have greasy hair, you don't necessarily need to shower. Just spray your roots with a bit of dry shampoo. It absorbs oil, and you don't need to wash it out. Use a shampoo that's designed for dyed hair. Regular shampoo doesn't contain what your hair needs to stay hydrated and retain its color. Condition your hair after every shampoo. Conditioner for color-treated hair works best, and some even contain ingredients that mimic your hair's natural lipids. When you condition, pay particular attention to the ends of your hair. They're the oldest parts of your hair, so they are more likely to be damaged or dried out. Avoid using hot styling products, such as curling irons or hair dryers. Heat stresses your strands, and when they're weak, they may snap. Cut back on sun exposure. The sun's rays fade your color and weaken hair, which contributes to breakage. When you go outdoors, wear a hat to protect your hair. Opt for an ammonia-free dye the next time you color your hair. Products that contain ammonia strip nutrients and lipids out of your hair. Get your hair trimmed if it won't stop falling out. A cut will remove most of the dried-out hair, so you can start over with a fresh new style. Dyeing may not be the actual cause of your hair loss. You might lose some hair after giving birth or in the wake of a traumatic event, for example. Hair also falls out after dramatic weight loss or chemotherapy. Conditions that cause hair loss include anemia, hypothyroidism, polycystic ovary syndrome (PCOS) and lupus. Don't get your hair colored and permed at the same time. Coloring already weakens your hair, and perming makes it worse.